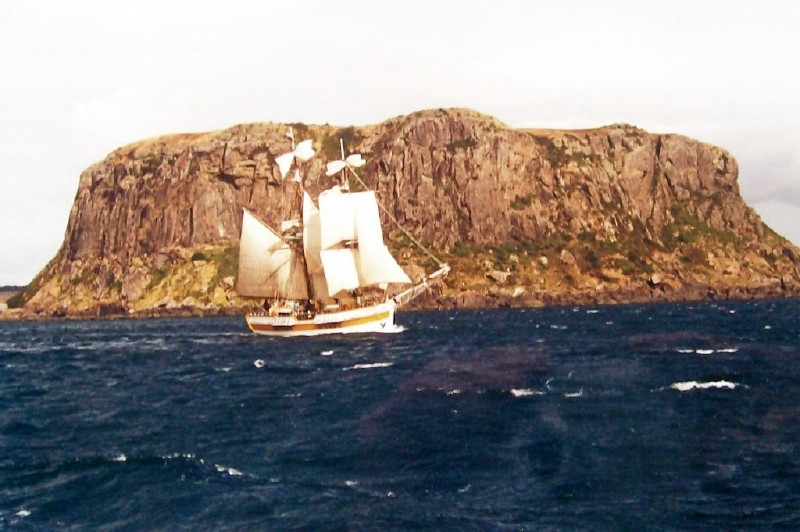 Over the past ten years I have often been asked how I obtained the photo of the Lady Nelson in full sail at Stanley in 1998. 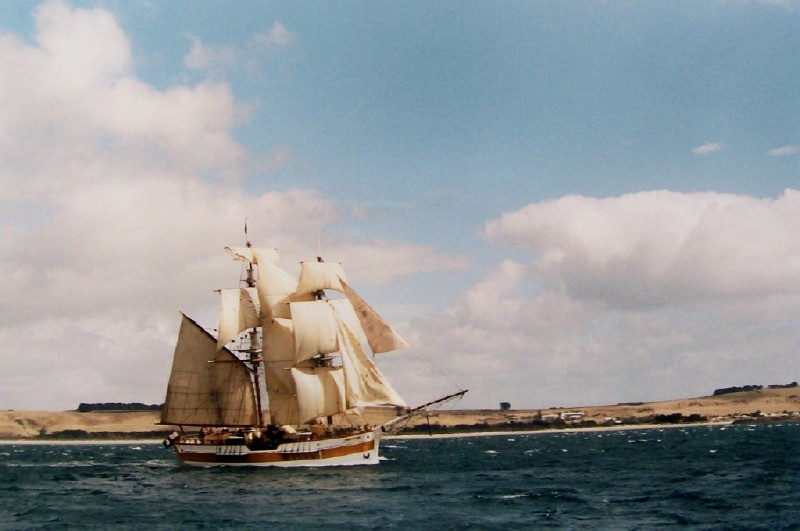 It had been a full year for the Lady Nelson in 1998, she sailed to Sydney early in February to celebrate the 210 years since the First Fleet had sailed into Sydney Cove. This was a wonderful experience and one I will always cherish. There were tall ships in Darling Harbour from all over the world. 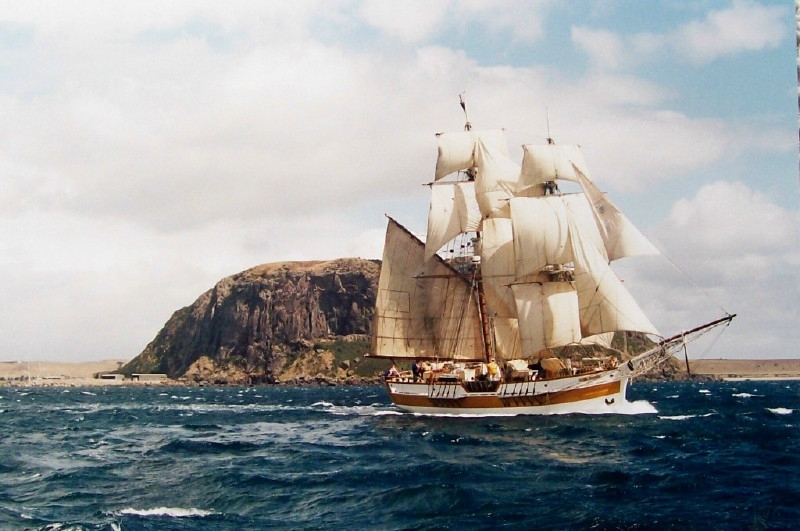 On her return to Hobart the Lady Nelson set off for the first circumnavigation of Tasmania. As previous arranged we were to meet Kerry Pink who wanted a photo of the Lady Nelson in full sail on the cover of his book “Against The Tide”. Kerry had hired a fishing boat and with a professional photographer on board and had arranged to met up with us just off the nut at Stanley. I knew Kerry and asked him if I could go on board the fishing boat and take some photos. The Lady Nelson was waiting for her relieving crew to join her from Hobart for the next leg to Strahan on the west coast, and there were only six crew on board. The first run was a bit of a disaster as the crew was not able to get all the sails up before she went past the fishing boat. I remember the captain saying ‘never mind she can do it again'. Little did they know who long it would take to drop the sails and sail/motor back against the wind. Watching the Lady Nelson sail off into the wild blue yonder I knew it would take over an hour to come back, what we didn't know was that Jack the skipper on the Lady Nelson, did not know that that we hadn't taken the photo of her in full sail. As she passed us on her way back Kerry called out and asked Ken could we do it again. By this time it had started to rain and the sun was gone. Never the less off she went again. This time it all went beautifully and just as the Lady Nelson passed us the sun came out. The fishing boat returned to Stanley while the Lady Nelson again sailed over the horizon in her endeavour to turn around and sail/motor back. I found myself put ashore without any money to wait for her. The captain instructed me to go up to the café (which he owned) and have a cup of coffee on him. 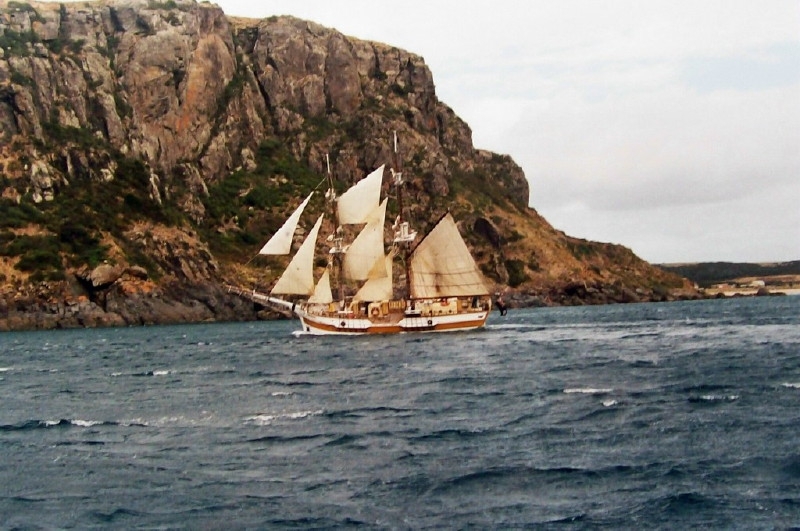 This was not quite the end of the story, I was to return to Hobart for a spell before going to Strahan to complete the last leg of the circumnavigation and it wasn't till I arrived home that I realized that I had left the film in my wet weather gear near my bunk. It was over a month from taking the photos that I had it processed. 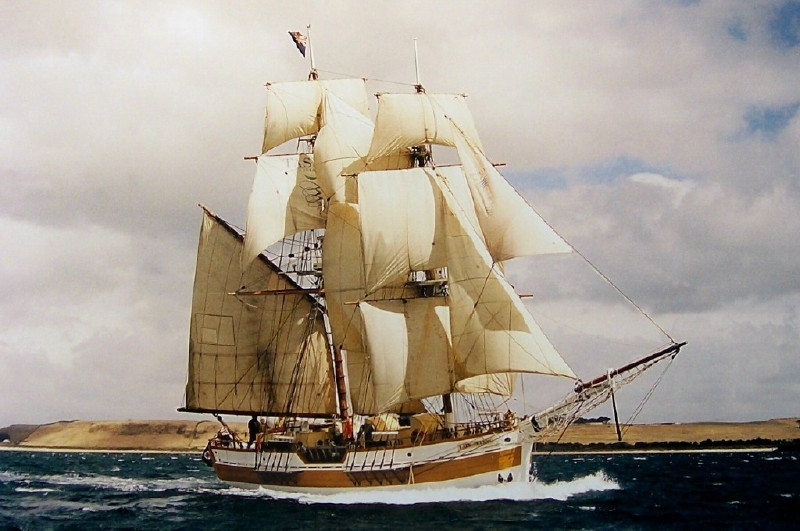 The photo has been used for many purposes over the years, on our uniforms, on a medal, and made up into nearly 3,000 cards for sale on the Lady Nelson, and one of the others as our raffle. It has also appeared in many books that I have gladly given permission to the authors to use. The first photo is how she looked on her first try, I call it having her hair in curlers. The next two are of her returning to Stanley before doing the second run and taking the photo of the Lady Nelson in full sail. Everyone enjoyed a beer when it was over, without that wonderful crew these photos would not have been taken. It had taken me three years to get on to another boat to take a photo of the Lady Nelson in full sail and three hours to take the photo, but it was worth it.